Week 12 of Flying Pig Training, in the middle of a run, it dawned on me that this was the marathon that I had had to want the most. This was the start line that took me the longest to get to, the first time I had injuries and setbacks in my way, and the toughest conditions I’d ever had to train in. Getting to the start of this race felt like a victory in itself. I realized then that I hadn’t run the last three marathons I’d signed up for. In 2015 I was registered for Houston and Boston, but since I was pregnant I decided to only run the half at Houston and forgo my travel plans to Boston because I was not one of those women eager to be running a marathon while pregnant (only half crazy!). After having Witten, I wasn’t really sure when I would re-visit 26.2 training or when I would even want to. In 2016 after Witten was born I actually had a pretty successful year of running. I ran a 1:35 half, less than a minute off my PR, and a 10 mile race series where I ended up taking 1st place in my age group over the series and PR’ing at the 10 mile in 1:11. Things were looking good so I was itching to sign up for a marathon. At the end of 2016 we learned we would be moving over 1,000 miles away from home to Columbus. Within the first week of moving here I found the amazing MRTT group and couldn’t believe how huge the running community was here. Being so excited I decided to sign up for the Columbus Marathon as a fun way to explore the city and I love something about being a part of my city’s marathon. A few weeks later I came down with plantar fasciitis, a runners worst nightmare and managed to sprain my ankle in May. I spent 85% of 2017 not running focusing on strength training and did a lot of hiking which was great for exploring and seeing the beauty of Ohio, but I started questioning if I’d ever be or feel like a runner again. I decided in the summer to transfer my marathon entry to my friend Julia since it didn’t look like it was in the cards for me. Witten and I spectated the race and cheered Julia on and it was then that I decided to get serious about doing some PT work on my foot and figure out how I could get running again. It took a lot of trial and error, massage, boring foot and hip exercises, but running started becoming manageable in November and I ran a 4 mile Turkey Trot. I slowly worked my weekly long run up a mile per week until I was up to about 7 miles with no pain in December. I decided to take a leap of faith on Christmas Day and sign up for Flying Pig Marathon. Several of my friends were either doing the half or full and had great things to say about the race and Sarah offered us a place to stay with her friend for the race weekend. I was totally unsure about how the training and race was going to go since it seemed so long since I’d trained for a marathon. I officially started training January 1 and it started off really great. I made myself a plan that was pretty structured with a weekly speed workout and long run plus a weekly mileage goal that increased about 10% each week and included cut backs. One of the reasons it seems like this was the Marathon I had to want the most was because I have never had to train in weather this harsh. Not only was this my first full winter in Ohio but it was a BRUTAL winter even for the locals. Looking back at my training log only TWO of my 17 long runs were above freezing. I ran through feet of snow on the ground and in sub 20 degree temps for the first times in my life. It took a long time to figure out what gear to wear, how to keep my hips warm, how many layers I needed, when I needed to wear hand warmers, etc. Getting yourself out of bed in the dark and literally freezing cold temperatures takes a lot of grit. My speed training and long runs were going well and I was progressively getting stronger and faster. I worked my mileage per week up from 30 MPW to 50 MPW, managed to run a 1:39 half in March, and completed my first 20 miler. I was feeling positive about the direction things were going. At week 12 of 18 I was out for a 14 mile run with Lisa and Sarah and managed to trip and sprain my ankle (again!). I barely made it back to the car and had to cut the run short. I ended up having to take a full week off from running, resting, icing and elevating my ankle as much as I could. I was pretty sure I had to throw the towel in on my training and I was going to end up not running Flying Pig; another DNS or transfer. One week later, Lisa encouraged me to test my ankle by running her 2 mile shakeout run with her for her marathon that was the next day. I ran the 2 miles and realized my ankle didn’t feel good, but running didn’t necessarily make it feel worse. Lisa was seriously a god-send she is a Physical Therapist and came over to look at my ankle for me and gave me some great advice. At that point I decided I would just take my training day to day and week to week. I ended up running only 3, sometimes, 4 days a week and doing a lot of cross training cardio on my bike and elliptical. My mileage dropped to 30-35 miles per week. I had to abandon all speedwork and just do all my runs at an easy pace. I was able to get another 20 miler in and a 19 miler which I had to do in back to back weeks. Normally I like to do at least 22 miles, but it wasn’t possible with my hubby’s travel schedule and due to taking my running day by day and week to week at this point. Even in the week leading up to the race I was still feeling iffy about my ankle and just praying it would carry me 26.2 miles. During my taper I went to see a massage therapist/chiro which provided me a little bit of relief. I spent almost all of race week trying to stay off my feet and not running. My bike and I were BFFs. Besides the “drama” of my sprain I SO enjoyed training for this race. This was the first time I trained for a race with friends. I have always been a solo runner and I absolutely loved sharing so many miles with amazing women and enjoyed always having someone I could count on to run with. If it wasn’t for them I KNOW I wouldn’t have run through the brutal winter and if it wasn’t for Lisa I think I would have lost hope that I could still finish out my training. The week of the race I was seriously a rollercoaster of emotions. I was showing all signs of tapering madness and questioning my ability to run more than 19 miles which was the last long run I had done 3 weeks before. I decided my race strategy would to be to set out at an easy pace like I normally would with my long runs somewhere between 8:20 and 9 pace. The course is notorious for being hilly. Anytime you mention Flying Pig the first thing people mention are the hills so I wasn’t sure what to expect pace wise. The biggest climb of the race is from miles 6-9. I figured I’d run miles 1-6 fairly steady, give myself some grace to get up the 3-ish mile hill and then just see how my legs felt after that. I knew I wasn’t in shape to BQ so I didn’t see any real point in trying to force myself to get a certain time. I honestly just wanted to get another marathon under my belt and finish happy. My only real goal became to not run my slowest marathon which was my first marathon in 3:54. Saturday morning after lots of frantic packing I had coffee with a group of friends from my Moms club which helped calm my nerves. After that, Lisa picked me up so we could meet Sarah to head down to Cincinnati. The expo was great. Parking and packet pick up was painless, there were tons of booths, and an explosion of Pig Decor. I finally jumped on the Goodr bandwagon and picked myself up a pair of White&Pinks at the Expo. After the Expo we stopped at the grocery store to pick up pre-race meals. My stomach had been a ball of nerves the whole week of the race and was even worse on Saturday so I settled on some soup and a turkey sandwich. We stayed at Sarah’s friends house who graciously offered to let us stay and were in bed by 8:30 PM. The alarm went off at 3:30 am so we could get some coffee in our systems and use the bathroom. We were dressed and in the car by 4:50 and made it to the parking lot by 5:30 for the 6:30 race start. After finding bag drop off and bathrooms it was time for the three of us to part ways and head to our separate corrals. When I got to my corral at 6 I decided to get in line for the bathrooms just in case I needed to go again before the race. I was glad I made that decision because I didn’t even get to the front of the port-o-potty line until the Gun-start went off. I ended up being a few minutes behind and one of the last people out of my corral right in front of the corral C crowd. The Start: The start was very congested. Right after I crossed I heard what sounded like a gel hit the ground and then I realized it was mine that had fallen out of my spibelt. I had only packed 4 gels even though I thought I might need 5, so now I was just down to 3. I ended up taking them all out of my belt and carrying them in my hand so I didn’t lose them. In the beginning I tried to stick with running a pretty even effort that matched the people around me as I didn’t want to waste any effort bobbing and weaving. It was a pretty humid morning and I started to sweat within the first mile. During the race I ended up having to get water at every single table to stay hydrated. Miles 1-4: I ended up right near the 3:40 pace group which I mostly stuck with until mile 5 ish. This part of the course takes you over a bridge of the Ohio River into Newport, KY for a few miles and then back over another bridge into downtown Cincinnati. It is a mix of up and downhills crossing the bridges which was evident in my first several splits: 8:21, 8:01, 8:16, 8:03. Mile 26.2: The crowd started to thicken around the city and I felt the energy a bit to pick up the pace. There were a group of volunteers passing out “Pig Tails” which were gummy worms and I grabbed some. I saw Sarah right at mile 26 and was so happy to see the “Finish Swine” in sight. Splits: 8:59, 8:50 (for the .2) I finished under my goal time in 3:50:17 and I was all smiles to be finished and finally run a marathon again! Cincinnati really knows how to put on a race. The spectators and volunteers were amazing. While I was running I was feeling so thankful for all the volunteers along the course passing out water. It was so hot I must have stopped at 20+ aid stations for water alone. The spectators were also amazing providing us with treats, cheers, and words of encouragement. The whole city really is behind this race. I was so glad that everyone warned me of the hills. I feel like I expected the worst of them and because of that they seemed a lot more manageable. In hindsight, I wish I wouldn’t have slowed down so much in my last 6.2, but I think my nerves got the best of me having not run more than 20 miles in training. I feel happy with my time, but I know in the future I have the ability to keep my pace. 2017, the year of no running, was actually really good for me. I learned that while running is such a great part of my life, there is so much more to life than just running. I found more fulfillment in my life as a Christian, wife and Mom without the distraction of training plans and goals. I gained an appreciation for my health and respect for rest and recovery. I improved my relationship with food and nourishing my body. I truly enjoyed this training cycle and treasured this marathon even more after taking a big chunk of time off. Two weekends ago my friend Janine and I enjoyed a refreshing weekend of hiking, dining and relaxing in Hocking Hills. The goal for the trip was to complete the famous 12-mile Grandma Gatewood hike. I met Janine shortly after moving to Columbus via Hike it Baby and we instantly connected over a passion for nature & hiking. As an added bonus our sons are only about a month apart in age and are quickly becoming best friends. Janine recommended a book to me about a famous Ohio hiker Emma Gatewood aka “Grandma Gatewood” who was the first woman, at the age of 67, to hike the Appalachian Trail. She was a true trail blazer who paved the way for the Grandma Gatewood Trail which is part of the larger Buckeye Trail. The book was a very intriguing story. If you are interested here is the link to the book: Grandma Gatewood’s Walk. The Grandma Gatewood trail itself is a must in Ohio Hiking because it connects three of the top nature gems in the state: Old Man’s Cave, Cedar Falls and Ash Cave. Naturally, after reading the book and about the trail we were both motivated to tackle the hike. Initially we thought we might try hiking the trail while baby toddler wearing, but after a couple of trial 5-6 miles hikes with the boys we realized that wasn’t going to work. They would get restless after a few miles and enjoyed making loud monkey noises for the entire. three. hours. At least we know they could scare any dangerous wildlife away! Hocking hills is a great destination weekend from Columbus because it is only about an hour and 15 minutes away. Our weekend started off on Friday afternoon. We checked into the hotel and immediately bounded out for a short hike at Cantwell Cliffs before the sun set. I want to say this was my favorite and the most picturesque sight the whole weekend. After coming down the steps known as “Fat Woman’s Squeeze” you are immediately taken to a hollowed out cliff that looks like a huge cave. The view was exquisite! We were happy to see a lot of the water was still frozen after a week of “warmer” temperatures as we wanted to see some frozen water falls the next day. After scoping out the cave we hiked the one mile loop around the area. Friday night we enjoyed an impressive spread of meat, cheese, wine, nuts, and to-die-for bread (from Dan the Baker). Since I was driving for the weekend Janine offered to handle all the food and she did not disappoint. We stayed at The Inn at Cedar Falls which was a cozy bed and breakfast nestled close to Cedar Falls. The property has several cottages, yurts and rooms as well as a spa and highly rated restaurant. Our room had a hummingbird theme and was stocked with hiking magazines, books, and a relaxing faux fire place. Breakfast was included in our stay and we were delighted to find out it was a menu style breakfast and not a buffet. Going into the weekend the weather predicted heavy rainfall all day for Saturday and upon waking in the morning the radar looked less than promising. We didn’t mind hiking in a little bit of drizzle, but weren’t looking to hike in the pouring rain with freezing temperatures. We decided to go ahead and pack up lunch and hiking gear and head to breakfast until sunrise to make an official game plan. We were a little discouraged by the forecast but we thought at worst case rain scenario we could drive around and at least explore Old Mans Cave, Ash Cave, and Cedar Falls. After breakfast the skies held off so we went on our way. Long story short, even though it was supposed to pour for all 7 hours of our hike we hardly had any rain! It was amazing. We took off thinking we would just walk until we felt we needed to turn around, but ended up making it through all 13 miles and a stop for lunch without any heavy rain until the very last mile. We were so thankful and kind of in awe when we realized how fortunate we were. Later we admitted that we didn’t want to make a mention of the weather because neither of us wanted to jinx our luck. We started out from the top of the Old Man’s Cave area and the view was immediately beautiful with views of frozen falls and icicles. The gorge trail drops down to the Upper Falls area. It has a large pool of water surrounded by cliffs called The Devils Bath Tub. We made our way through to Old Man’s cave. As a family we visited Old Man’s Cave for Mother’s Day, but with everything being frozen it provided such a different perspective. The trail takes you through a tight gorge with really neat rock walls, hemlock trees and periods of steep steps past the Lower Falls which were still crystal clear blue and beautiful even though the skies were grey. I didn’t take any pictures in Old’s Man Cave or the lower falls because my hands were freezing. We stopped to put hand warmers in at the falls. The prettiest and most enjoyable part of the hike was the 2.5 miles between Old Mans Cave and Cedar Falls. The trail takes you along the bank of the creek in between the creek and cliffs lined with trees. There were so many amazing ice formations and seasonal waterfalls to gaze at. This part of the hike took us the longest to complete as we had to climb over rocks and roots and stopped several times to enjoy the views. We hit Cedar Falls around 11 am which is about the half way point of the out and back hike. Cedar Falls seemed to be the days most popular attraction because it was pretty crowded both on our way out and back. I snapped a photo on the way back. Rumor has it the falls were completely frozen the weeks before out hike. Grandma Gatewood’s Trail takes you from Cedar Falls to Ash Cave. Honestly the route was not marked super clearly and you have to cross the parking lot of the visitor center to jump on the trail which isn’t obviously marked. This part of the trail (about 2.5 miles) is known for being the most “boring,” but any day outside hiking is not a boring day in my book. The trail was dirt path which was very muddy after snow melting the days before. The trail goes along the forest service road and I can envision it being very beautiful in the fall when the leaves change. Around 1 o’clock we landed at Ash Cave. It was stunning! I couldn’t believe how gigantic it was (it is the largest cave in the state). Views included many icicles, seasonal waterfalls, pigeons nesting in the cave, sand underneath the horseshoe shaped cave and a running water fall. We decided there was no better place to stop and enjoy the lunch we packed. The Grandma Gatewood Trail is an out and back trail so once we made it back to Cedar Falls we noticed there was a Gorge Overlook Trail we could take back to Old Man’s Cave that was about 3 miles so we decided to explore it on the way back for a different view. The trail itself was woodsy with a few inclines. It overlooked the creek that we previously hiked adjacent to, but you couldn’t really get close enough to the edge to see the water. We stumbled upon Rose Lake about halfway through the hike which was a nice surprise. We made it back to the car a little before 4 o’clock with enough time to shower and enjoy a drink at the hotel before our dinner reservations at 6. The hotel has a charming meeting area called the Gathering Place with a fireplace and games, like checkers and chess. It was the perfect place to rest our legs after hiking 13 miles all-in-all. Our reservation was at the Kindred Spirits restaurant which is on site at the bed and breakfast. I was craving some soup and ended up with the seafood chowder and spinach salad. Both were excellent. The service at breakfast and dinner were also great. The staff was really friendly and one of the servers in the morning even told us about a helpful new app for Hocking Hills where you can download trail maps and park information. Secretly, I was trying to save room for Almond Croissants Janine had brought for dessert alongside Trader Joe’s Almond Sparkling Wine. To finish off the day I got my Yoga mat out to do some Yoga with Adrienne since I was on day 27 of a 30 day yoga challenge. Janine mentioned I was maybe a little crazy, but it did my legs some good. The next day we set our alarms for 6 am so we could go check out one last site in the State Park, the Rock House. We got there right at Sunset. It was a bit of a foggy morning, but the hike to the Rock House is less than 1/2 a mile so it made for a short hike, but very neat destination. Because of the time of day it was hard to take pictures inside the “house.” It is an enormous tunnel over 200 ft. long. There were tons of pigeons in the cave cooing which, coupled with being the only people there at dawn, made it admittedly kind of creepy. Shortly, we hiked back to head to breakfast and then enjoyed an hour massage at the spa before hitting the road back home to our boys. It was overall a delightful weekend of activity, a little relaxing, great food and enjoyable company. We decided an annual hiking trip is definitely in order and as a goal we’d like to explore different parts of the Buckeye Trail. I would love to hear about a great hiking trip you’ve been on. After a few weeks of cold and snow in the house we were feeling ready to get out of the house this past weekend and we had a blast just being a bit spontaneous and exploring some new sites. Friday morning started off with 7 icy miles with Lisa. Lisa asked if I wanted to do a “later” AM run at 7:15. I am always excited when someone wants to run with me in the daylight hours instead of headlamp hours so I happily obliged. Later in the morning, Witten and I made a short trip out to Lancaster to have lunch with our friends and check out a well-known play place there that we had purchased a Groupon for a few months back. Lancaster is about 30 miles southeast of Columbus which makes it a perfect little day trip. In fact, we made it home in time to still squeeze in an afternoon toddler nap! Not going to lie, the part of the day I was most excited for was lunch at The Well. It is a charming restaurant located one block off Main Street in Lancaster. They had an adorable play area with a wooden tree house, kitchen, and books that kept the boys highly entertained and the staff was so welcoming to them. The menu boasts so many delicious, seasonal, and organic choices. Check it out! I feel like I need to visit seasonly to see what’s on the new menu each turn of the season. I had a hard time deciding what to get, but ultimately chose The Horsey Bowl and the winter tonic. The tonic was apple cider vinegar, orange, ginger, baobab, and stevia. I definitely plan on replicating this drink at home. Cheers! After lunch we headed over to “AHA!- A Hands on Adventure” children’s museum which was in perfect walking distance from The Well. This play space did not disappoint. One thing I loved about the space was that it was multiple exhibits, but all in one open room which was great for keeping an eye on a wandering toddler. Sample exhibits included an art zone, fishing lake, bulldozer, fire truck, crane, lego table, vet office and Witten’s favorite, the water table. Friday night when JJ got home we decided to go check out the 50% off and buy one get one free sale at Fleet Feet in Polaris and grab some dinner. Unfortunately I didn’t find any running shoes. It’s always tough to find sales when you wear the average shoe size! Dinner was at Molly Woo’s Asian Bistro. Honestly, the food was just okay, but I was there for the company of my boys. Saturday morning I got in some cross training time on the elliptical then JJ suggested we take a trip out to Mt. Vernon, OH just to poke around and get out of the house. Mt. Vernon is about 50 miles NW of Columbus, so it made for another perfect day trip. First stop was Ariel Foundation Park which was a gem that JJ found looking for things to do in Mt. Vernon. The park is a 250-acre former glass-making factory that has architectural ruins of the factory, an observation tower, and other sculptures. As soon as we got to the park we spotted the observation tower and decided to make the trek up until we both realized how freakishly high up it actually was. You can see the ground beneath you with every step on the way to the top. With the slippery snow conditions and toddler in tow I was too nervous to go all the way to the top. I definitely want to revisit the park when its warmer with a goal of making it to the top of the tower. We spent a good hour and a half trekking through the snow and looking at the various sculptures and buildings, but I think the highlight for us Texas folks was enjoying being outside in the snow. I would love to go back and explore the park more thoroughly in the warmer months, it was a great find! After the journey in the park we headed over to the town square to see what Mt. Vernon was all about. I have a love for small town squares and seeing a view of its history/foundation. While making the drive through town we saw a sign for an Italian bakery and needed no convincing to pull into the spot right outside the front door. Oh man! This bakery had soooo many delicious looking treats it was hard to choose. JJ decided on a Texas Kolache which he said was so spicy and lived up to its name. I chose a cup of coffee and a Chocolate Caramel Macaroon which was like a Girl Scout cookie on steroids. It was seriously so. good. We also snatched a few samples of chocolates and a filled to order Canoli. Cookies for lunch? Witten definitely approved! The bakery was called Ferrari Baking Company. Turns out the owners were actually originally from Houston, TX so it was fun to make a little connection with them. It is definitely worth checking out if you’re in the area. Sunday morning I set off for my long run with a lovely group of ladies. The running community here in Columbus is so amazing and I absolutely love that I can always count of having someone to enjoy miles with. I ended up doing about 8 miles with the group and 5 miles on my own because I needed to hurry back to get ready for church. It was nice to get a break from the crazy temperatures, but still enjoy the views of snow on the trail. There were a few crazy spots where I felt like I was doing hurdles, but I am completely soaking in these new experiences. The rest of Sunday was filled with church followed by our traditional lunch trip to Whole Foods, grocery shopping, yoga, and a little relaxing. I have an exciting weekend of hiking in store this weekend and I can’t wait to share some pictures and experiences. What fun have you been up to on the weekends? Have you had a lot of snow where you are at? There seems to be cold winter all over the US! It was January 1, the first day of the new year and also Monday. Two days notorious for new beginnings and resolutions for hitting the gym. I woke up, poured myself a cup of coffee, read a devotional, browsed the internet for new recipes, and just relaxed before the rest of the family woke up. This seemed like odd behavior because I almost always get out of bed early to start my day off with exercise. It also seemed a little odd because this day marked day one of an 18 week training plan for Flying Pig. The plan was to rest and to delight in rest. Which also happened to be my “resolution,” or word for the New Year. REST. It seemed to be the reoccurring theme I found myself reading about, hearing about, or contemplating towards the end of 2017. In the midst of a year long bible study in Romans I kept finding myself thinking “This is a beautiful truth I can rest in.” It seemed like a strange conclusion given the first few chapters on wrath and sin would appear to be anything but restful at a glimpse. Shortly after I discovered a great podcast Sorta Awesome and was so intrigued and motivated by the episode on Seeking Rest and Finding Delight. I would highly encourage any and everyone to listen to it. The episode is about practicing Sabbath, but not in the traditional strict “though shalt not do anything fun on Sunday” kind of way I know I used to think of Sabbath as. It talks about taking time for rest, renewal, and restoration. Whatever that means to you. I have always found it hard to rest. I am an on-the-go kind of person; I have two modes: sleeping or moving. I not only forget (choose not) to take rest days from exercising, but I also have trouble just being and being present. I always find myself cleaning something or just walking stir crazy circles around the house feeling like theres something I should be doing something. So, it’s not surprising the word REST was brought to my attention so much. This year I want to put rest into practice and truly relish in it. I plan to set aside time to put away my to-do or should-do lists and do whatever it is that sounds delightful that day. Naturally, whatever feels restoring to me in a particular moment may be ever-changing. It could be spending time with family, or spending time in solitude, reading a book, or taking a walk, making a nice meal, or having dinner with a friend, spending time in nature, or curling up indoors, doing some yoga or taking a complete rest day. I think putting rest into practice and actually enjoying it will be a learning process. So far this January we have had a lot of snow and very cold weather in Ohio which has given me an opportunity to practice taking pleasure in rest. I have used this as an opportunity to just enjoy being at home indoors with my son and being present. We haven’t had a lot going on around us besides playing trucks, reading books, and venturing out to throw some snowballs. It actually feels really great to give myself permission to relax and relish in relaxation. I have a feeling each season will bring its own definition of delight and rest and that sometimes I may have full days to devote to resting and sometimes I may only have few hours. We would all benefit from taking time to rest and just be present. We all need time to purposely refresh, cherish and celebrate the simple things in life. I woke up this morning thinking it was Friday for a hot minute and thinking the week just blew by. We got back from our Christmas trip to Texas last Friday which made the weekend of unpacking and organizing seem more like a Monday. Then New Years day felt more like a weekend than a Monday and THEN it felt like we had another Monday on Tuesday. Phew! It has been downright cold. It was in the 30s&40s when we visited Texas and I kept looking at the Columbus forecast calling for temps below zero and was feeling a little weary about going back home to temperatures I’d never experienced in my 32 years. I kept saying out loud, “I don’t even know what negative 4 feels like!” Well, it feels freakin cold. Before we moved to Columbus I claimed that once you get below 20 degrees it all probably feels the same- cold is cold. Well I was wrong, the colder it is the colder it feels and it can keep feeling colder. Imagine that. Another thing I’ve never experienced in my 32 years is all the SNOW! I am loving the snow. We got about 5-6 inches on Saturday. I’ve never seen that much snow in person. My little Texas soul was giddy to watch it coming down. We played outside and I made my first snow angel ever and a pretty good sized snowman. Because it’s been so frigid, the snow has stayed on the ground all week. I love it! We had about a month where someone (or everyone) in our house was sick. It’s that tough time of year where you want to get out of the house to keep from going stir crazy, but there are so many germs out there because of cold and flu season. I have always been a fan of the Emergen-c Drink mixes, but discovered the gummies a few weeks ago. The gummies are a great and actually pretty tasty way to get an extra dose of vitamins for cold and flu season. I’ve kept pretty healthy since I’ve been taking them and they’re a nice little afternoon pick me up that surprisingly curb an afternoon sweet tooth. This has been on our list of places to visit in Columbus since we moved here. Franklin Park is a conservatory and botanical garden with various plant and flower exhibits and artwork. A friend of mine texted me on Tuesday and asked if I wanted to go walk around the conservatory in the afternoon with our boys to get a little exercise and I jumped at the opportunity. It was truly beautiful and such a great place to get glimpse of greenery in the dead of winter. They still had their poinsettias, Christmas trees, and gingerbread houses on display so it was nice see one last sprinkle of Christmas. We will definitely be going back to check out some of their activities and spring events. I don’t know if it’s from being indoors all day or just finally getting around to decluttering a bit after the holiday season, but I’ve been feeling the need for some organizing this week. Particularly the pantry and kitchen cabinets. Our pantry had been feeling messy and it was hard to see what was in there so I rearranged some of the larger items to the cabinets to make more room and parted with dishes we weren’t frequently using. If you know me, you know I don’t like to keep a lot of stuff we don’t use; I consider myself a bit of a minimalist around the house. I also quite enjoy putting a podcast in my earbuds and cleaning/organizing so I’ve been digging it this week. What things are making your world a little happier this week? So I used to write a little blog here, but let’s just say it’s been a little while (6 years <—- WHOA, but who’s counting?) I did not realize it’d been so long until I just thought about it and counted the YEARS. So let’s just cut to the chase and catch up. I started this blog shortly after I was a newlywed and over the last 6 years I’ve celebrated 7 years of marriage to my wonderful husband and we had the most amazing baby boy, Witten, who is not so much of a baby anymore at 2.5 years old. My husband and I bought our first house in our hometown of Houston and then a few years later we sold it to make a big move across (and very north of) the country in Columbus, OH. It has been almost a year that we’ve called Columbus home. I have absolutely loved living here and exploring a new city. Both JJ and I were born and raised in Houston and went to college there, so 2017 has truly been a year of adventure for our family. I am blessed to get to stay at home with my son and this city had proved to be a great place to do so. On the running front I’ve ran too many races to recount in the 6 years since I stopped blogging. I finally qualified for and ran Boston in 2014 which was AMAZING and I hope to one day run it again so I can soak in the experience more. Since having Witten in 2015 I’ve completed a couple half marathons, 5k’s and a series of 10 mile races. Beyond running I’ve found a passion for strength training, hiking, and yoga. This past year in 2017 I’d been dealing with a nagging injury which opened up the door even more to exploring different kinds of exercising which I’ve actually really enjoyed. I’m not really sure what my intentions are with the revival of my blog or how often/what I’ll post, but I thought it might be fun to pop in with an update and see what I might feel like writing. 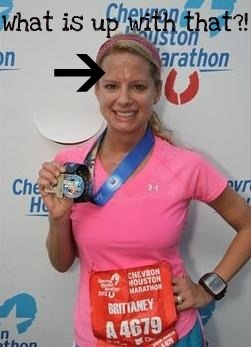 First thing here, I finally FINALLY got a good marathon finisher photo except what is that big glop- sweat? snot? smack in the middle of my forehead?! Brightroom you are no better than Raceshots. 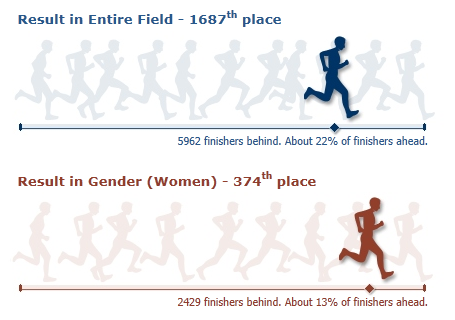 Second thing, Being the math nerd I am I love the marathon finish stats the Houston Marathon provides. Way. too. cool. 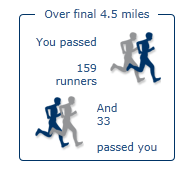 I felt like I was moving like molasses the last few miles, but I guess I wasn’t doing so bad. Lastly, I owe a big big big thank you to Rachael. 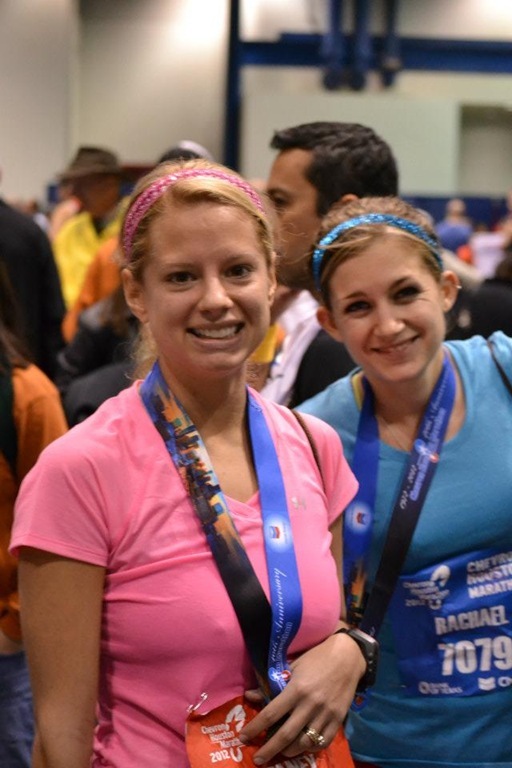 Rachael I don’t think I would have even made it through marathon training without you. You always seemed to be there for me when I needed someone to run with or complain about training to. I’m so glad we got to experience most of the marathon together YOU ARE THE BEST!! Welcome to my blog! 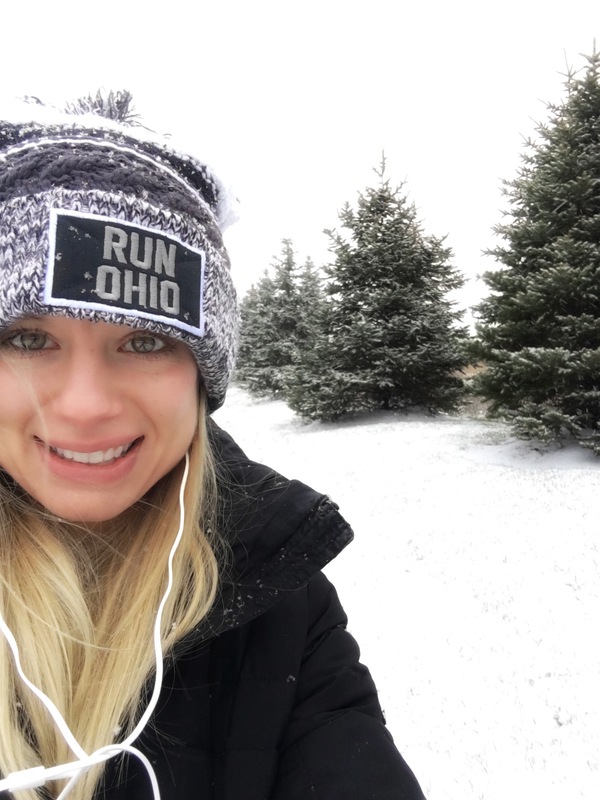 I’m Brittaney: Christ follower, wife, boy mom, runner, fitness enthusiast and nature lover. I strive to acheive a healthy life balance through fitness, food, and everything in between. This blog is for random ramblings on fitness, food and life. Thanks for stopping by. Look for the Pink Chick to find FitChickBritt Fitness, Eat Well, and Healthy Living Tips.